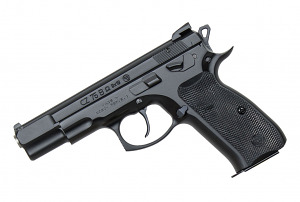 The CZ75B Omega is a further evolution of the 75 B. This Convertible version allows users to swap from decocker to safety operation in the same manner as the popular P-07/P-09 pistols. This pistol has a simplified, robust variation trigger system as the previous Omega. The trigger parts use an interlocking design that allows for easy disassembly and reassembly without the need for tools.